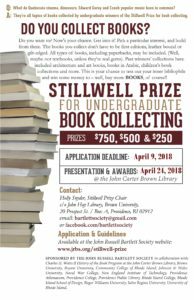 Stillwell Prize for 2018 – Open to all undergraduates attending a RI college or university. Deadline for entries April 9. The presentations and awards will be given on April 24 at 6pm at the John Carter Brown Library.